The first day of school for many students means a snappy new backpack, freshly sharpened pencils and bright white notebook paper to start the year off right. 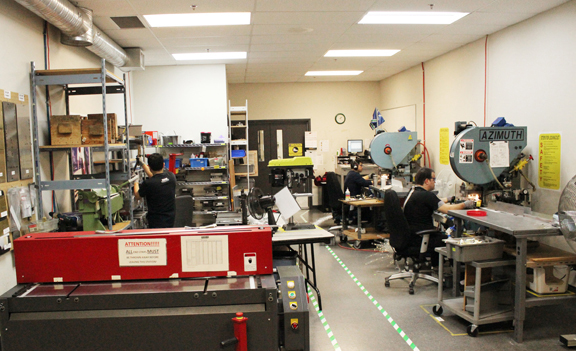 The folks at Imprint Plus (UPIC: imp8687) can infuse that same excitement into the first day of a new job or a new company with their name badge and desk plate kits, which are manufactured and assembled at the Canadian supplier’s facility in Richmond, British Columbia. The process by which Imprint Plus’s Mighty Badge kits, name plate kits and other workplace necessities are created relies on a lean manufacturing philosophy that focuses on delivering value to customers by minimizing waste, says CEO Marla Kott. “The concept of preserving value with less work is the backbone of ‘lean’—and the goal we set for ourselves. The simplest item to produce is the desk plate, says Kott, and the most complex is the insert sheet that enables product customization and personalization. 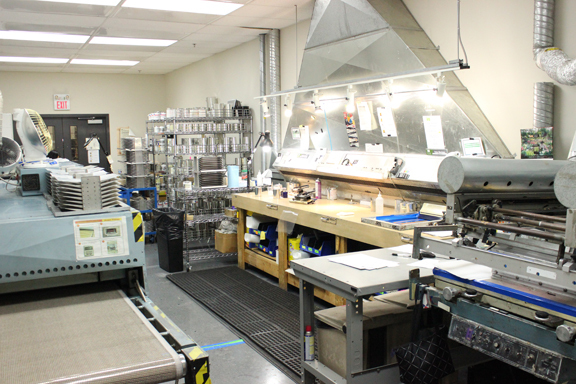 Imprint Plus utilizes a variety of specialized materials and specialized equipment for production, and ensures its staff members are properly trained for the task at hand. Read on to learn how Imprint Plus produces materials for name badges and desk accessories for use in a variety of business settings. 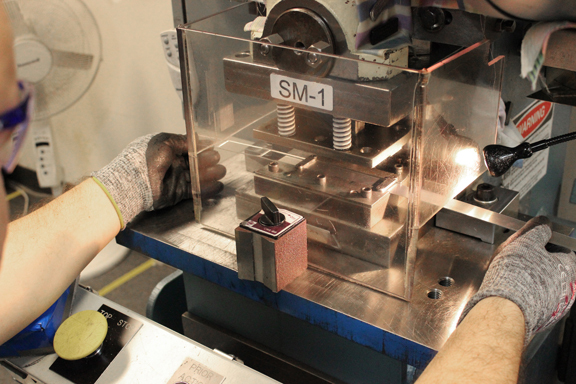 Metal name badge plates are fabricated and have holes punched on-site at the Imprint Plus facility in Richmond. Paper badges are customized with names or logos—or both—in the screen printing shop. Factory specialist Edward Browne works on the custom packaging line to ensure the kits are complete before they are shipped. 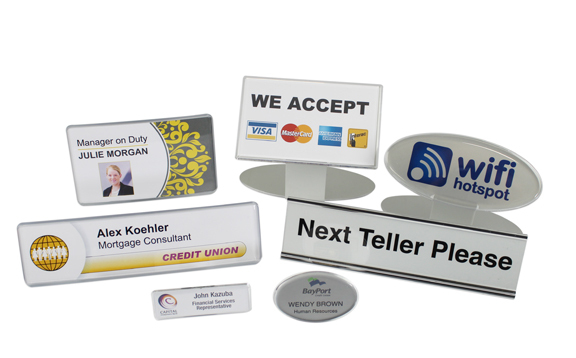 Imprint Plus’s popular kits are prepacked with all the components needed to create name badges, desk plates and signs. 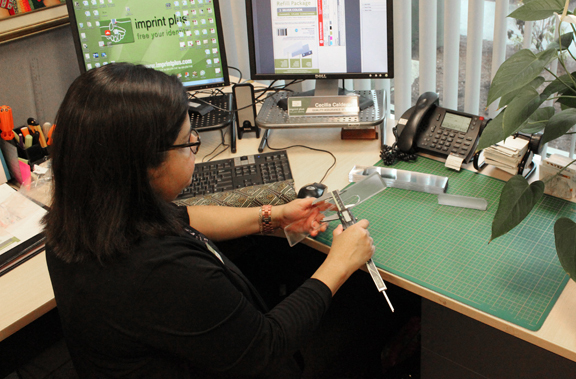 Quality Assurance Specialist Cecelia Calderon measures to ensure Imprint Plus products meet strict tolerances. Each plate, lens cover and insert sheet is 100-percent guaranteed to snap together seamlessly. 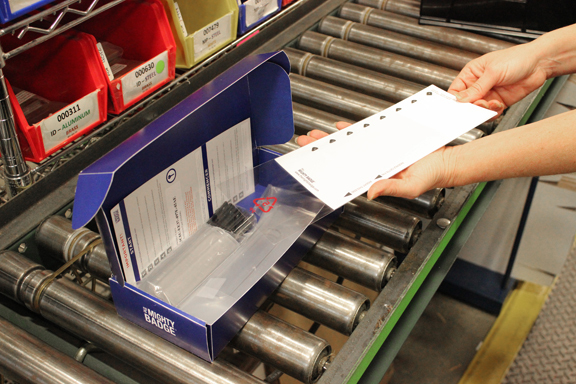 Imprint Plus utilizes lean manufacturing practices in every aspect of business. 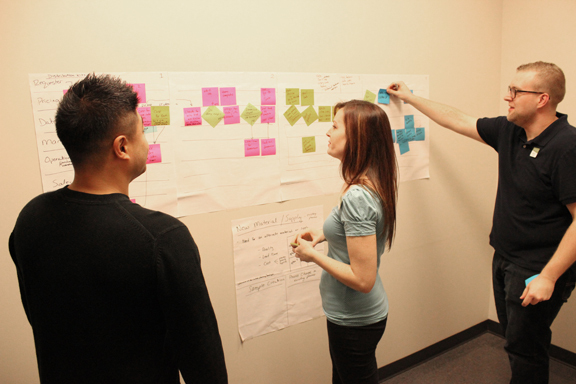 (Left to right) HeeJun Moon, operations support; Bonnie Wall, operations manager; and Bryan Freitag, logistics coordinator, collaborate on a project using Lean Kaizen principles.  Name badge kits that include software, insert sheets to customize and personalize, plates, lens covers and a magnetic backing.  Standing sign kits that include software, insert sheets to customize and personalize, the one-piece sign and a lens cover. 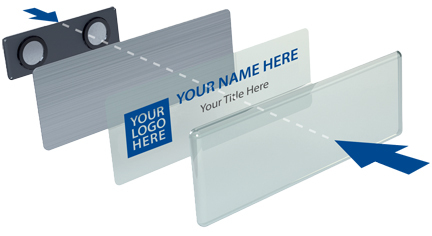  Contemporary desk plate kit that includes software, bright white insert sheets to customize and personalize, the holder, stand and cover, which fit together by pressure alone. Have you ever attended a meeting, an alumni or networking event, and chances were you’ve been asked to write your name on a sticker label and place it on your shirt? Well believe it or not, those identification badges are actually recognized today; a day dedicated to celebrating your name and name tags, or name badges. Perhaps you can only recall wearing those self-stick labels that says, “Hello, My Name is ______________, but name badges have grown and innovated throughout the years – to serve a purpose as a resourceful tool for many small and large businesses. Nametag Day, is also referred to as National Nametag Day, is an annual event that takes place during the first complete week in March. 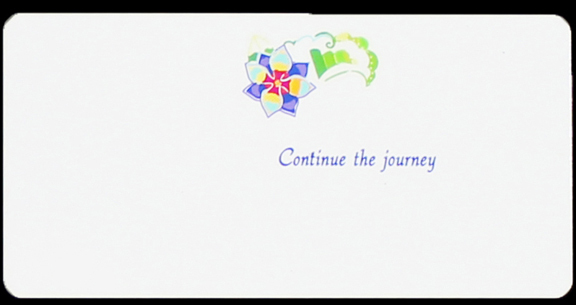 This year’s event occurs on March 10, 2016. Other special days during the week-long event include Namesake Day, Fun Facts About Names Day, Unique Names Day, Discover What Your Name Means Day, Middle Name Pride Day and Descendants Day. Be sure to celebrate Nametag Day today with your staff by proudly wearing a one infront of your customers! You never know, today might just be a good day to use name badges as a conversation starter. And if you’re a start up business new to name badges, we’ll be happy to help you out with a selection of customizable and personalizable badges for your staff. The Specialty Graphic Imaging Association (SGIA) has announced the 2015 winners of the acclaimed Golden Image Award Competition. The annual competition evaluates and judges hundreds of entries in a multitude of categories to determine the leaders in industry excellence with stand-out graphics worthy of recognition. the Mighty Badge, a leading manufacturer of customized, re-useable name badge and signage systems, received a total of five awards including: a Gold award for Spurgeon Manor and a Silver award for Vivoli in the Metal Signs/Products category; a Silver award for Outdoor Adventure and a Bronze award for Lady at the Lake for the Heat Transfers category; and a Bronze award for Food Buffett Signs in the Unique Applications category. The Golden Image competition is judged on the technical accomplishments of each entry, excluding aesthetic issues from the evaluation and scoring process. Prints are judged on the level of difficulty and quality of execution. “Winning multiple awards puts the Mighty Badge among the top specialty printers in the world in terms of graphics excellence, caliber and capability,” continued Ms. Kott. For more information regarding SGIA and the Golden Image competition visit www.SGIA.org. For more information regarding the Mighty Badge name badges and signage, visit www.themightybadge.com. See our Winning SGIA Submissions and Runner-ups Here! SGIA is the only international association for specialty imaging. Specialty imaging comprises digital imaging, screen printing and the many other imaging technologies SGIA members use, including those they will tap in the future. These are the imaging processes and technologies employed to create new products and to enhance existing products including point-of-purchase displays, signs, advertisements, garments, containers and vehicles. the Mighty Badge manufactures an assortment of name badges and systems that range from customized name badge systems for the small to mid-size businesses with 10+ employees to YouWho name badges in two- and four-unit kits. the Mighty Badge recently introduced its multi-language version of its “plug and play” Name Print Graphics (NPG) software. The new software supports five languages of English, Portuguese, German, French and Spanish for creating professional looking name badges in print text with graphics on any PC. In addition to the multi-language feature, the new software offers foreign language character input for Chinese and Japanese languages. 2015 Winners of the Specialty Graphic Imaging Association (SGIA) Awards! • Winners of the Metal Signs and Products, Gold Award for Spurgeon Manor, and a Silver Award for Vivoli Name badges. • Winners of the Heat Transfers, Silver Award for Outdoor Adventures, a Bronze Award for Lady at the Lake Name Badges, and 1 runner up with the Gusto Divino Name Badge. • Winner of the Bronze Award for the TableTop Food Buffet Sign in Unique Applications, and 1 runner up for the Silver 2” x 10” Healthcare Professional Classic Desk and Door Name Plate. Canadian Business and PROFIT today ranked Imprint Plus™ as one of Canada’s Top W100 Female Entrepreneurial Companies based on a three- year revenue growth. Listed at #42, Imprint Plus™ is one of the top rated women-owned Canadian companies on the list. Ranking Canada’s Fastest-Growing Companies by three-year revenue growth rate and profitability of Canadian businesses, the 27th annual PROFIT 500 profiles the country’s most successful women-owned growth companies. A joint venture between Canada’s premier female business brands, the PROFIT W100 is published in the October issue of Canadian Business and online at PROFITguide.com. Ever walked into a hotel or a bank where English is not widely spoken and wondered, now what? Well, that’s often the case for people who don’t speak English as their first language. Eventually, they learn to share information through pictures or hand gestures, but wouldn’t it be great to be greeted by a staff member who speaks another language, your language? What a refreshing possibility, these customer service stars could be easily identified by their name badges. Language barriers are a common challenge in business settings, for both customers and employees. Most people don’t realize how important basic communication is to providing a superior customer service experience and a core foundation towards creating lasting relationships. 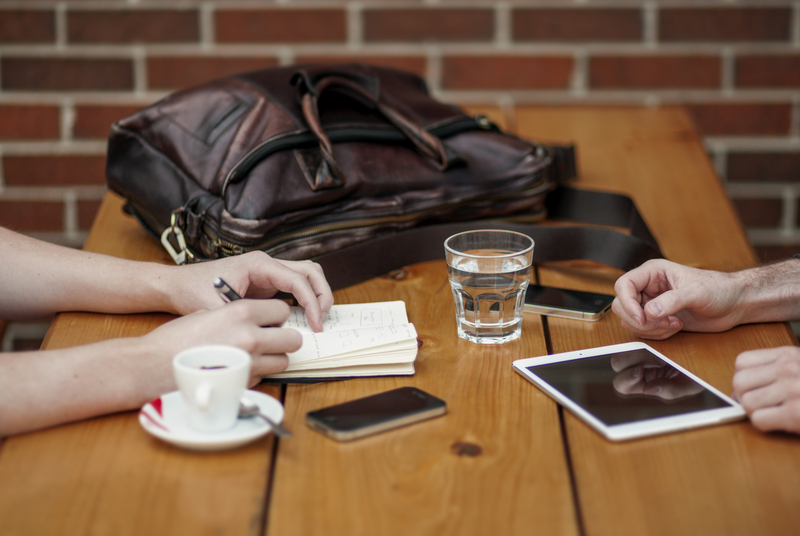 Here are some ways to help you navigate around these communication problems. Now that you know how to overcome some of the basic issues with language barriers, you’re ready to get your staff all set up to effectively communicate and serve your clients. And if you’re wondering where to get some great name badges with language identification, be sure to check out these name badge kits and badge talkers! Let us know if you have any other tips for effective communication relating to language barriers with your customers. Share your comments below! For more information on great name badges and special offerings, Click Here. Students, Alumnus, Parents, and New-comers love to chit chat with everyone, especially the faculty reps. The first thing these people will ask is “What Is Your Name?” or “Where Can I Find the Closest Washroom?” Let’s hope they have their proper signage prepared for the second question…but even sometimes with restrictions on hanging signage on campus, school reps are there for a reason: to connect and be the tour guide for whatever the guests may require – name badges are a must. A huge portion of on-campus business caters to services for students; however, that still leaves a number of departments in which to tailor a special message…so take a few steps back when branding your back-to-school campaigns and make sure your message is relevant to your audience. 2. The National Archives Building and the National Mall, Washington, D.C. Many businesses will be decorating their store with flags, balloons, and national coloured streamers. What about printing large posters showcasing your patriotic ‘must-buy’ products and services? Your customers are too busy planning what the holiday will look like – show them your products that let them take their event up a notch. Offering them a giveaway is always well received, everyone likes free stuff. Similar to businesses, badges serve an important role for football tournaments. Business staff name badges worn by employees may not resemble the ones worn by the world soccer champion players, but they certainly have the same purposes. The badges worn by our champion soccer players symbolize their team’s success on a previous year’s victory, and also to identify the national team they are on. Others, who are also sporting out their name badges during this major event, include the organizers, ambassadors, and volunteers from around the world to promote their organization’s involvement for the championship. So where’s your badge swag?